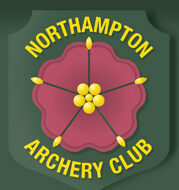 Thirteen Archers Represent NAC at Indoor County Championships and Five Come Away with Trophies. No less than thirteen members of NAC shot at the Indoor County Championships held at Rothwell on the 8th March and five became trophy holders. James Mason (compound), Ian Hyde (longbow), Lizzie Cantopher (recurve), Susan Corless (compound) and Harley Warner (Junior recurve) are all county champions for Northamptonshire and are to be congratulated on a great performance on the day. Paul Bond (Recurve), Ian Hannaford (Recurve), Paul Hyde (Longbow), Christine Gibson (Recurve) and Heather Major (Barebow) meanwhile all came away with medals, whilst Mick Lovell (recurve), Steve Gibson (recurve) and Lizzie Lovell (junior recurve) achieved very respectable scores. What a great day for NAC – well done. ← A member of the NAC to Represent GB!